In addition to its Italian good looks, the superb-handling Benelli R1 Pro sports a brand new recoil-reducing stock. Say the word Benelli at a party and the head of every waterfowl and upland hunter in the room will snap to attention. Without question, the Italian brand that pioneered the inertia-driven system has forever changed the landscape of autoloading shotguns. Hunters love Benelli’s M2s, Montefeltros and Super Black Eagles, and the company’s scatterguns have won over a number of competitive 3 Gun shooters as well. Though the bulk of Benellis sold in this country are shotguns, the brand does offer a line of centerfire rifles, and while R1 fans may not number as many Benelli shotgun owners, they are just as passionate about their firearm of choice. The R1 is not a brand-new gun; it’s been around since the 1990s. It utilizes the same Auto-Regulating Gas Operated (ARGO) system found in the popular M4 tactical shotgun, which was adopted as U.S. Joint Services combat shotgun. The ARGO system has gas ports located just ahead of the chamber, which, Benelli says, reduce fouling. Pistons press against the bolt itself, which has a metal tail section that travels into the stock and is returned to battery via a spring. Since the pistons press directly against the bolt, there are no linkages that take up space in the fore-end and add additional parts to the system that could wear. The design is simple, straightforward and trim, which keeps weight to a minimum and eliminates the need for a large, bulky fore-end. This simple and reliable system is a major reason that so many R1 owners are die-hard fans. The newest member of the R1 family is the R1 Pro, and it is chambered only—at least currently—in .30-06 Springfield. The Pro is similar to other R1s in basic styling and function, but there are some significant differences. First, these rifles have standard adjustable iron sights with fiber-optic tubes. The rear sight is secured in a sleek, durable carbon-fiber housing, and the front sight is adjustable and can be easily replaced. The rifle is also drilled and tapped for a Picatinny rail, so mounting a scope is fast and easy. 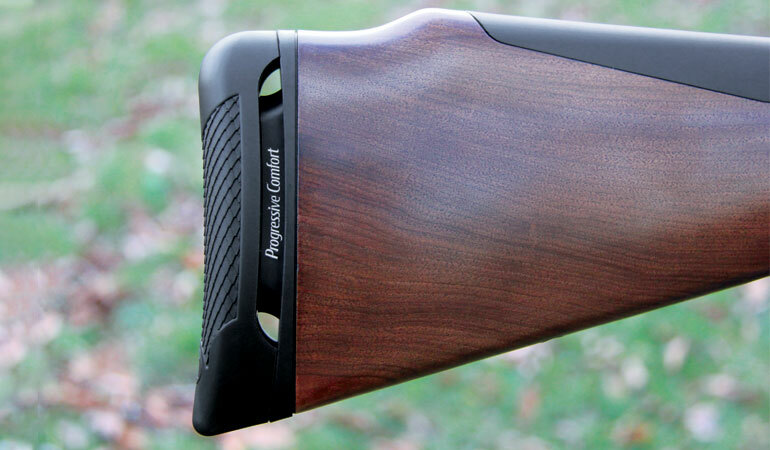 Other upgrades include a bronze finish on the receiver and a higher-grade wooden stock. 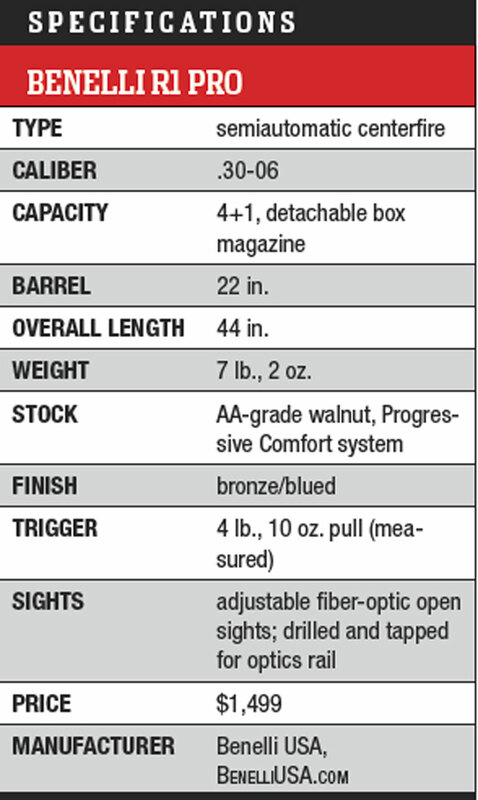 Benelli lists the walnut as AA grade, and it’s certainly that good or better. Perhaps the most significant upgrade to the Pro, however, is the addition of Benelli’s Progressive Comfort stock, which is borrowed from the Ethos shotgun line. Interlocking baffles within the stock act as shock absorbers when the gun is fired; the baffles flex to absorb much of the recoil before it ever strikes the shooter’s shoulder. Combine this with the R1’s cushy recoil pad and the system does an admirable job reducing rearward force. That not only makes for a more pleasant shooting experience—especially from the bench—but also allows for faster follow-up shots. Three locking lugs on the front of the R1’s bolt face provide solid and consistent lockup, and the large extractor takes a big bite on the rim of the cartridge. There’s a spring-loaded ejector that will appeal to everyone except brass hawks who like to keep track of every spent casing because the Benelli’s ejector sends empties whirling through the air with authority. The Progressive Comfort system minimizes recoil through baffles in the stock, and the synthetic comb is comfy. The stock adjusts for cast and drop via replaceable inserts. The test accounted for about 70 rounds total, and there were no issues with feeding, ejection or extraction. 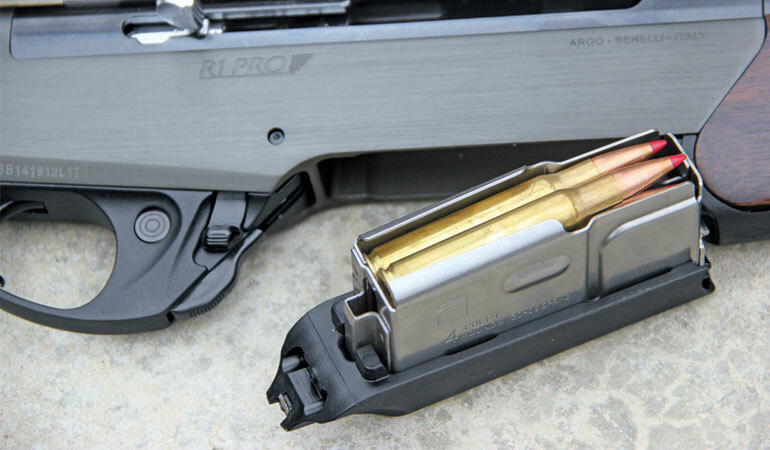 The R1’s detachable magazine holds four rounds; cartridges are alternated to the left and right when loading and are separated by a metal lip within the magazine. The magazine release is incorporated into the front of the trigger guard, and while it does take a bit of oomph to secure the magazine back in place, there’s no question the magazine is indeed secure—provided it was properly seated. The trigger on the rifle I tested broke consistently at four pounds, 10 ounces. Driven hunts are popular in Europe, and there’s no doubt the R1 Pro was designed with this type of hunting in mind. It weighs seven pounds, two ounces unloaded and balances more like a fine shotgun than a traditional hunting rifle. The ARGO system’s minimal dimensions allow for a near-perfect front-of-receiver balance point, and the fore-end comes with a rounded belly and full-length finger groove for a secure, comfortable hold on the rifle when tracking moving targets. Likewise, the pistol grip is more rounded than most bolt guns, and it feels much like the grip found on the Ethos. 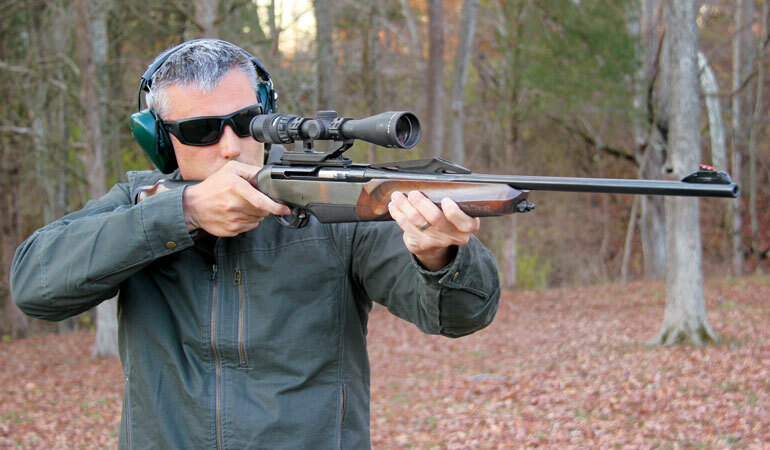 Balance is rarely a deciding factor in the purchase of a hunting rifle since few North American shooters spend the majority of their time shooting at running game, but the R1 Pro’s grouse gun-like handling characteristics make it an ideal “brush rifle.” The 22-inch barrel has a thin profile and receives the same Crio treatment as Benelli’s shotgun barrels. Benelli freezes its barrels to -300 degrees, relieving the stresses associated with hammer forging and creating a slicker metal surface that aids in cleaning. The R1 has a barrel twist rate of 1:11. The R1 Pro’s box mag holds four rounds and is released via a lever at the front of the trigger guard, which also houses a crossbolt safety. 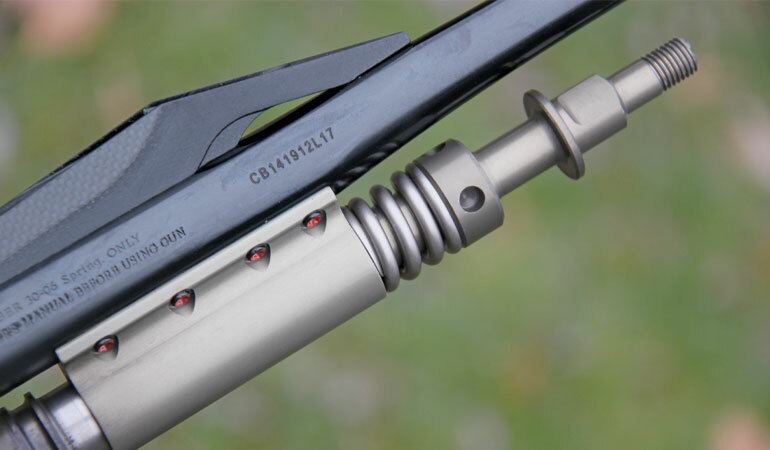 As with its shotguns, Benelli includes a selection of shim kits for customizing the R1 for drop and cast. It requires removing the recoil pad and the Progressive Comfort kit, and there are locking plates that match each of the shims. The whole process is relatively simple, and the various shims included with the rifle and drop values range from 45mm to 65mm (roughly 1.8 to 2.6 inches). You can also replace the synthetic comb that is integrated into the walnut stock. The rear sling stud hole has a plastic insert, and you can install the included stud by removing the recoil pad and Progressive Comfort kit. Benelli also throws in a pair of sling swivels, a wrench for sight adjustments and a bottle of oil. The R1 Pro arrives disassembled, and piecing this gun together may seem like a daunting task, at least until you’ve completed the process a time or two. After a few practice sessions operations become far more intuitive. Removing the handle on the bolt allows you to slide the bolt assembly into the rear of the receiver, and replacing the bolt handle keeps the bolt in place. The ARGO gas system has two gas ports located just in front of the chamber. Pistons press back directly on the bolt, eliminating the need for linkages or action bars. The fore-end is released by unscrewing a nut on the front; since it is trapped in the stock, it won’t bounce off the table and leave you on your hands and knees cursing as you try to find it. The sling stud at the front of the grip cap doubles as a tool to loosen the retaining nut and spring on the front of the gas system. The barrel/receiver assembly slides into place over the gas assembly, and it is important to be certain the tail of the bolt is resting firmly in the center of the depression on the front of the stock. With the barrel and receiver in place over the gas system, you can use the front sling stud to tighten the gas assembly retaining nut and you simply replace the fore-end and screw the nut tight. It’s actually an ingenious and—once you are familiar with the operations—simple system. And after 70 rounds, I was impressed by how little fouling had accumulated inside the rifle. I tested the R1 Pro with and without a scope. For the standard 100-yard accuracy evaluation, I mounted Benelli’s Picatinny rail ($100, available from the company). The rifle comes with rubber inserts in the holes on the receiver, and those must be removed before mounting. I decided to use a Leupold Mark 2 Integral mounting system, which works well on my Scout rifle and AR, and secured a Trijicon AccuPoint 3-9x40mm scope. I ran three different loads through the rifle. The R1 favored Federal’s 165-grain Ballistic Tip load, with groups averaging 1.2 inches and the best three-shot group measuring right at an inch. My initial reaction was the Progressive Comfort stock lives up to its recoil-reduction claims. A week prior to testing the R1 I helped a friend zero a bolt-action .30-06 that weighed about the same as the Benelli, and there’s no doubt that the R1 kicks significantly less. Is it like shooting a .223? No, but the Benelli stock keeps recoil at comfortable, manageable levels. The Leupold base allowed me to quickly and easily remove the optic for iron sight testing. That portion of the test was fired offhand, and I was particularly interested in seeing how quickly the R1 could get back on target. One of the primary reasons hunters purchase semiauto hunting rifles is for fast follow-ups, and with the Progressive Comfort stock you can deliver a second aimed shot with this .30-06 in a hurry. The fiber-optic sights are excellent. As someone who grew up hunting deer with shotguns in Ohio and suffering with coarse, hard-to-see-in-any-light irons, I was impressed by what Benelli offers on the R1. These are not sights the company installed as an afterthought. The narrow V rear sight has two green fiber-optic tubes, and the front sight has a single red tube. It’s easy to obtain a clear sight picture, even in low light or if your vision isn’t as sharp as it once was. Frankly, if you’re an iron-sight shooter, the Benelli is a solid choice based on this feature alone. For those who are accustomed to bolt guns and ARs, the controls of the R1 will take some getting used to. The crossbolt safety is integrated into the front portion of the trigger guard, and the mag release lever, as previously mentioned, rides on the face of the trigger guard. There’s a bolt release lever located just above the magazine release, too, although when you insert a loaded magazine, the easiest way is to simply pull back on the bolt handle and release, which chambers a round. If you have any concerns you’ll accidentally dump a magazine while looking for the safety, let me assuage your fears. The position and design of the magazine release require you to make a dedicated effort to drop the mag. This may seem like a bit of a nuisance at the range, but you won’t accidentally tap the release and be left with a single-shot rifle. The R1 is an interesting alternative to bolt guns and AR hunting rifles. Like its brand-mate shotguns, the R1 is reliable and handles well. It has a few quirks, but once you learn to assemble and disassemble, load and fire the R1 Pro, it becomes a rifle that grows on you. Not only does it have striking Italian good looks, but also it’s a functional hunting rifle.